Melt the white chocolate, and use a spoon to form discs of the chocolate 3cm in diameter on a sheet of baking paper. Roll the fizzy sweet belts into circles, and use a little bit of hot water to stick them together if you need. Then place them on the chocolate discs. Put them in the freezer for 20 minutes to set. 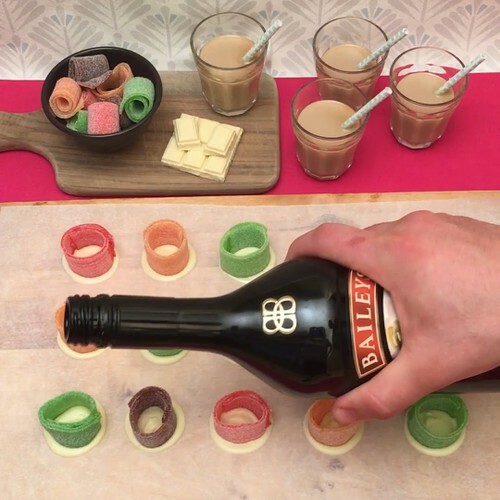 Pour Bailey's Irish Cream into each shot and add whipped cream and sprinkles on top. Cheers!